In 2015 we devoted a great number of Festival recital programmes to our focus on two composer anniversaries in particular: Jean Sibelius (Finland) and Alexander Scriabin (Russia). To complete our survey of �the Nordic tone�, Norwegian composer Edvard Grieg could not be left out, of course! Our annual CD of performance highlights from 2015 reflects that choice of repertoire, with the title �Sibelius, Grieg and Scriabin�. CD1 is devoted entirely to the piano music of Jean Sibelius. Finnish pianist Henri Sigfridsson interprets the Six Impromptus, op.5 and the Five Pieces, op.75: an �arborescent suite� that reflects Sibelius�s profound connection with nature by portraying different species of trees. Rudi Spring, a proven connoisseur of Sibelius�s piano music, then proposes a selection of brief piano miniatures, followed by Andrey Gugnin, the winner of the Gina Bachauer Competition in 2014. With Gugnin�s rendition of the Five Piano Pieces, op.85 � a �flower suite� � we return to the subject matter of Op.75 featured at the beginning of this CD: nature. Ya-Fei Chuang and Robert Levin have been faithful to the Festival for many years. Thanks to their immense command of repertoire, they are often featured in our set of annual CDs. On the second disc in this boxed set, devoted to works by Edvard Grieg, the duo plays the Norwegian Dances for piano four hands, op.35, clearly inspired by the �Nordic tone� of Grieg�s home country. Pianist Benjamin Moser has also been featured in previous boxed sets of the Edition Klavier-Festival Ruhr. On this occasion, he performs a selection of Grieg�s Lyric Pieces, �an intimate slice of life�, as Grieg called them. Joachim Carr, on the other hand, is featured in our recording series for the first time. He also presents a selection of Lyric Pieces, along with the only Piano Sonata Grieg ever wrote � at the young age of twenty-two. The third CD in our annual boxed set for 2015 is exclusively devoted to the piano output of Alexander Scriabin. He wrote his Three Pieces, op.45 in 1904, a time in his life when he was devoting greater interest to literary and philosophical ideas. These are contrasted with the Five Preludes, op.74, the last work he completed: in 1914, just a few months before dying suddenly and unexpectedly from septicaemia. Both works are featured here in renditions by young Russian pianist Andrey Gugnin. Scriabin attempted to renew and further develop the sonata genre: already in his first four piano sonatas, the movements have very close thematic connections, as in Sonata No.3 in F sharp minor, op. 23, performed here by Chi Ho Han, and Sonata No.4 in F sharp major, op.30, performed by Pavel Kolesnikov. A laureate of the renowned Canadian Honens competition, Kolesnikov is also present on this CD with Scriabin�s Po�me �Vers la flamme� in E major, op.72. 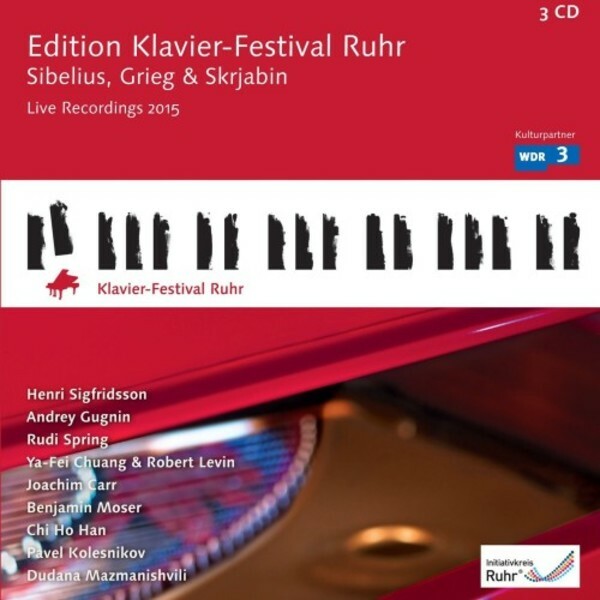 The Russian composer also composed Etudes throughout his entire life: thus, on this CD, we feature Scriabin�s Etudes in D sharp (op.8/12), C sharp minor (op. 2/1) and G sharp minor (op. 8/9), in renditions by Benjamin Moser and Dudana Mazmanishvili. Moser also plays one of Scriabin�s most impressive piano pieces, the Fantaisie in B Minor, op.28.